This the the blog section, with updates and news about Valpolicella wine region. Get to the Source. When it comes to Valpolicella wines, it's not easy to get to its roots. Like it or not, you drink wine brands. Now it's time to focus on the origins of Valpolicella wines... because origin makes a great difference, here in Valpolicella. We review regularly these wines: Valpolicella Classico, Valpolicella Classico Superiore, Valpolicella Ripasso, Amarone della Valpolicella, Amarone della Valpolicella Classico, Recioto della Valpolicella and Recioto della Valpolicella Classico. Discover wine prices and other insights about the best Valpolicella wines. The appassimento - i.e., the drying grapes process - dates back to Roman Age, and is widespread in all the Italy, at least. Romans did need to dry the grapes for concentrate the sugar of the berries in order to get sweeter and more alcoholic wines. This way, the wines lasted longer and could be shipped also very far. Obviously, Romans didn’t usually drink the pure wine, they preferred blending it with cold or warm water, depending on the season (and on the personal taste of the people). That was because in the banquets there were always many toasts, and if the wines would have been in purity, the people had got drunk quickly: a behavior considered uncivil, rude. That’s why in every banquet there was always a symposiarch, a guest in charge to set the right formula for drinking wine during the meal. If the wine was fine or excellent, it could be drunk as it was, but if it wasn’t that good, or was too young, the symposiarch generally mixed it with sea water, honey, salt, resin and even chalk. Anyway, back to the appassimento, in the Southern regions of Italy - where the temperature, the weather, and the sun were and still are more generous than in the Northern ones-, the drying grapes process started already in the vineyards or could be kept in the plain air. 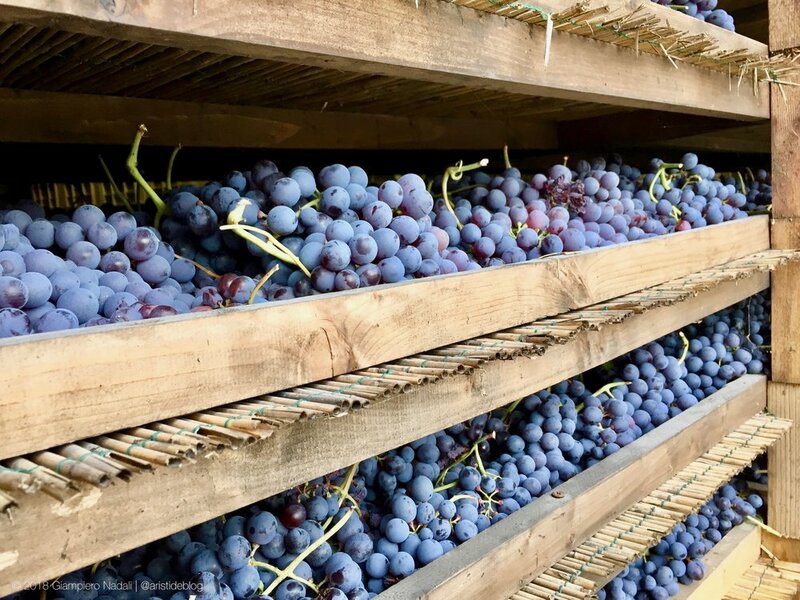 The grapes were laid on racks and left to dry in the sun and the wind for a few weeks before being pressed: a method that is used in places like as Pantelleria island (Sicily) even nowadays. Elsewhere, as in Valpolicella, the grapes were needed to be put in special ventilated rooms, hanged to ropes, laid on racks or in wooden boxes, and there staying for many weeks until the producer decided that was time for them to be pressed and fermented. Thus, what is this "resting machine for grapes” stuff? 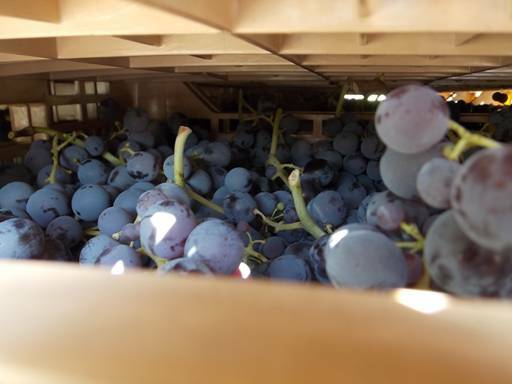 Put simply, it’s the method which the more traditional producers use to dry their grapes: generally, small wooden boxes. 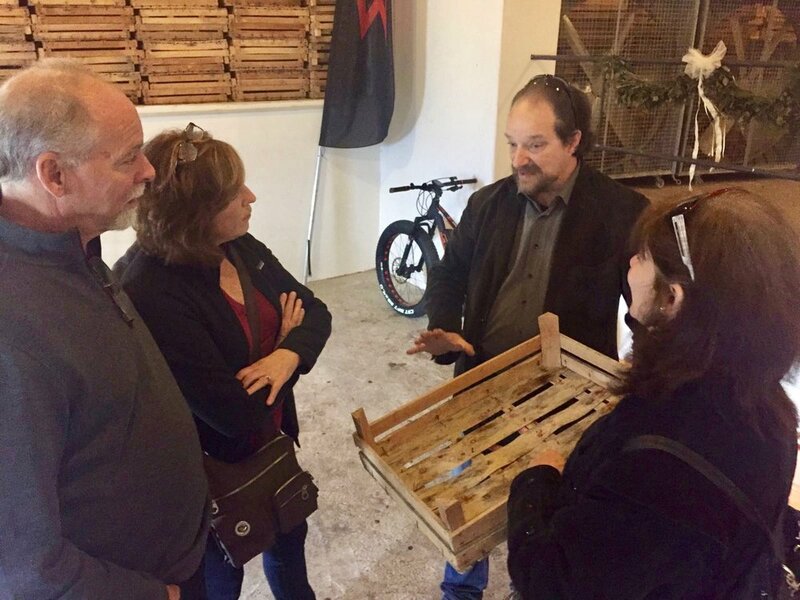 Being a natural material, the wood absorbs the humidity in the air (pretty dangerous for the development of grey mold) and the possible loss of juice from any broken berries; this way, the wooden boxes guarantee the best conditions for a long and healthy drying process. If you visit the Valpolicella in the autumn-winter months (from Nov to Feb), you can see many different methods of drying grapes in the wineries, from the most traditional ones to the very modern ones. In the following pictures there are some samples of both the typology. Terroir Amarone delivers independent reports, tasting notes, wine reviews, wine travel tips, harvest reports, people and wineries in the land of Amarone and Valpolicella wines. Chief Editor Officers are Giampiero Nadali and Elisabetta Tosi, indigenous wine writers and marketers. The abuse of alcohol is dangerous for your health, drink only in moderation. Permissions beyond the scope of this license may be available at this link.